The first official pic of the Venom movie is here, and it's... fine? But wait! Enhance! Our first decent look at the Venom movie is finally here. 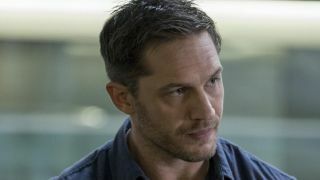 Sony has shared an official photo from the film with IGN, showing Tom Hardy in his role as Eddie Brock. I'll be honest with you: it's not really a particularly shocking pic since Eddie Brock is just an average guy about Tom Hardy's age, so it kiiiinda just looks like Tom Hardy as... well, Tom Hardy. It looks like this version of Brock will be fit, but not bodybuilder size like the original from the comics. It also looks like he has a hemp rope wristband and a forearm tattoo. Not exactly revelatory stuff, sad to say. But wait, what's that in his notebook? ENHANCE!! That *** recruit the **** ***lnerable the tests that more often t*** not end up *** **em? And here's where we get to the fun, speculatory part: at Brazil Comic Con Experience in December, Hardy and director Ruben Fleisher confirmed that the plot would (at least partly) follow the Venom: Lethal Protector comics. And in that short-lived series, it was revealed that a nefarious group called The Life Foundation had created five "children" of the original Venom symbiote. It looks like Brock, in his job as a reporter, is pressing The Life Foundation on its shady dealings. The mention of pharmaceuticals could point to the Venom symbiote having an Earthly origin (as opposed to being an alien from space, as in the original comics). The Ultimate Spider-Man comics did something similar, so it's not unprecedented. Or, pharmaceuticals could be a cover, and The Life Foundation is hiding the fact it has an alien in the basement. In any case, it looks like we've figured out this movie's villains. After several failed attempts to get the project off the ground, here's to hoping this version does the character justice.